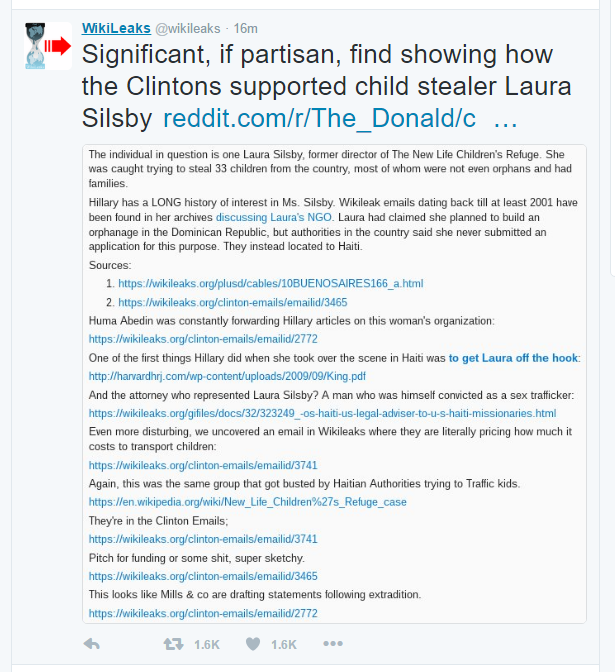 Ascension with Mother Earth and Current State of Affairs: Wikileaks: Clintons Support of Child Trafficking Laura Silsby! Over the past 48 hours, rumors and whisperings have emerged from the FBI’s reopened investigation into Hillary’s emails found on Anthony Weiner’s laptop that SERIOUS ADDITIONAL crimes were under investigation, unrelated to the email server case, involving among other things, child trafficking. including an email “where they are literally pricing how much it costs to transport children”. In January 2010, an earthquake in Haiti left hundreds of thousands of people dead, injured, and displaced, and over a million homeless. Three weeks after the earthquake, Haitian authorities arrested a group of Idaho missionaries for attempting to cross the border into the Dominican Republic with 33 children, without papers or proper authorization. The missionaries claimed they had the good intentions to set up an orphanage, 3 but investigations showed that none of the children were orphans and that the missionaries may have been attempting to smuggle the children out of Haiti to be adopted internationally. Despite evidence of association with child traffickers, the Haitian justice system—prodded in part by President Clinton’s diplomatic efforts on behalf of the missionaries —determined that none of the missionaries were guilty of illegal activities, except the leader Laura Silsby, who faced a lesser charge of organizing illegal travel.